On May 26, IBEC – Institute for Bioengineering of Catalonia will be hosting the event “Become a researcher!”, aimed at BD and master students, which intends to offer research positions at the Institute. Prof. Julie MacPherson (Department of Chemistry, University of Warwick) has lectured for three days on “Electrical and electrochemical scanning probe techniques for imaging biological systems in fluid environment” at the University of Barcelona. Last 6th May Nano2Life has organised an industry workshop. This workshop, being one of the last events of Nano2Life, has been an international event offering a forum for the exchange of innovative business solutions with the participation of Nano2Life top research institutions. 28 participants from 17 companies from 5 different European countries have attended to this event. Mater is a Fomento de las Artes y del Diseño (FAD) project for the Ministry of Industry, Tourism and Trade, born from the increasing importance of materials in the development of our society. It starts with the exhibition “Mater in progress. New materials, new industry”, which revolves around innovation and technological development through materials, and is on show at the Sala de Exposiciones FAD (plaça dels Àngels 5-6), from February 8 until April 28, 2008. El Dr. Pau Gorostiza, cap del grup de recerca en Nanosondes i nanocommutadors de l’IBEC, ha rebut una Starting Grant de l’ERC per estudiar la neurosecreció per control remot d’exocitosi i endocitosi amb llum. On November 7, 2007, the public presentation of the IBEC was held within the framework of the IBEC Bioengineering and Nanomedicine Symposium 2007. 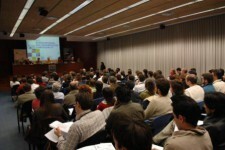 The event took place at the Antoni Caparrós Auditorium in the Parc Científic de Barcelona, with an excellent attendance of about 180 professionals. The prestigious reference textbook Molecular Cell Biology (Lodish et al.) has selected for its 6th edition (2008) a figure from the researcher at the nanobioengineering laboratory at the IBEC, Dr. Xavier Fernández-Busquets. Thanks to this important recognition of scientific excellence, the IBEC is the only Spanish institution appearing in the acknowledgements of the textbook, out of a total of 150 universitites and research centres.